Slides for my PHP at Yahoo! presentation from the Zend/PHP Conference & Expo 2005 are now online in PowerPoint and PDF formats. In 2002, Yahoo selected PHP for Web site development and began to phase out its own proprietary server-side scripting language. Three years later, Michael Radwin reflects on how the switch to PHP offered both technical challenges and productivity increases. The first part of the presentation offers a look inside Yahoo’s decision-making process to adopt an open-source scripting language. Radwin addresses why Yahoo selected PHP over other languages, focusing on the performance and stability required to serve billions of page views a day. In the second part, Radwin discusses Yahoo’s PHP development methodology, which has enabled its engineers to rapidly implement features while still creating software that is maintainable over long periods of time. At this exact moment, one week ago, you were negotiating your way into the world. You made quite an entrance! Now you have been with us one Sunday, one Monday, one Tuesday, throughout the week, and most recently, one holy Shabbat. Now that you have tasted of the world, you are ready to take your place among the Jewish people and receive your name in Israel. As we named you, we thought of who you might be, the aspirations we have for you, and how your name connects you to the larger Jewish people. And as we sit here writing this to you on the morning of your Brit Milah, we choose for you the name Noam Sidney, Noam Zaydel ben Moshe v’Ariella. The name Noam means “pleasant, gentle, sweet, kind, and tender” and these are all qualities we have seen in you this week, as well as in your gentle behavior in the womb and through your birth. We hope that it is a name that suits the personality that will develop and emerge throughout your life. We also gain some inspiration from our liturgy. As we put the Torah away in the Aron, we affirm the presence and importance of Torah in our lives. We say “Etz Chayim hee l’mahazikim bah”, it is a tree of life to them that hold fast to it. But we also say “derachehah darchei noam” — the paths of Torah are the paths of Noam. While the liturgy means to say that the paths of Torah should be paths of gentleness and sweetness, we also read the line to hope that the paths of Torah are the paths of you, our Noam. May you always find her paths to be paths of peace. The last line of that prayer asks God to return us to God, to renew our days. This line is said throughout the year, but it is especially applicable given your entrance into the world during Aseret Yemei Tshuvah. God, please call us back to you and we will return, renew our days as of old. Noam Sidney, we hope that throughout your life, you will remember the possibility of drawing close to God, return and renewal. We also want to share with you that although your name is Noam, and there’s nothing wrong with being docile and sweet, your mother wants to insist that there’s nothing wrong with being a little bit feisty either. Be not dissuaded from being passionate in the world, from finding a path that rocks the world a little bit, makes it a little bit better, even if that path is not such a sweet and gentle one. If you wanted to look to Noam Chomsky as a role model on that front, that would be okay by your parents. Your middle name is in memory of two special men, on both sides of your family. Your great-grandfather Julius’ older brother was named Sidney. He was a remarkable man, with a lifelong love of learning. The library he left when he passed away was vast and varied, reflecting a tremendous intellectual curiosity. We hope that this love of learning is passed to you as you live a life of Torah. Your great-great-uncle was a lawyer by profession, in Washington D.C. in the 30’s. He was a passionate champion of social justice at the forefront of the civil rights movement, and we hope that this too is something you share with him. Great Uncle Sidney was a devoted friend, husband, and father, and he is much missed and loved as we pass on his name to you. Your fathers’s grandfather, Sidney Landsman, was a mentsch of the highest degree. He loved babies and he would have loved you so much. He loved his wife and children. He was a hard worker and a successful businessman. Grandpa had his idiosyncrasies too — he was compulsively neat and he paid his bills the day they arrived in the mail, and he was always warning his grandchildren not to poke their eyes out, with whatever they were playing with. Most of all, your great grandfather was a very generous man. If someone he knew needed money, he would write them a loan, never expecting to be repaid. And he was as unstinting with his time as with his money. We hope you emulate some of his fine qualities of generosity and love. Your Hebrew middle name is also a name you share with him: Zaydel. As a Yiddish name which derives from the word for Grandfather, we will always be reminded of Grandpa Sidney. Even though you look like a little old man this week, we know it’s funny to name a baby “grandpa.” Nonetheless, we choose this name for you to connect you to the yiddishkeit of the generations that came before you. We have much more to say to you, and we God-willing will have many years together to say it. But before we end this first letter, we want to give you one small charge, also from the liturgy, albeit newer English liturgy. There is a line in the prayer for peace that we say on Shabbat, which speaks to us powerfully. We say, “We have not come into being to hate or to destroy. We have come into being to praise, to labor, and to love.” In some sense, this is all we do in the world: we praise God, we labor hard, and we love passionately. Today, we praise God in our hearts, thoughts, and prayers. We thank God for the creation of you — a new person, a new body, a new soul joining the Jewish people. Your presence reminds this entire congregation to praise God for the miracle of life. And by adding another voice to our immediate family, we now sing songs of praise to God in 3-part harmony. And as you labor in this life, draw upon the resources and wisdom of your family, which has a wealth of experience with various careers. Your family legacy includes lawyers and scientists, businesspeople, Rabbis, bakers, teachers, Kosher butchers, psychologists, urban planners, salespeople, and even perpetual students and software engineering managers. You too will someday find your unique contribution in the world, and we pledge as your parents to do all we can to help you do this. Lastly, we ask you to find the love in the world. We recommend to you now to live your life to the fullest. Explore, engage, interact, grow, and thrive as you make your path through the world. Love people, be loved, have your heart broken and mended, and draw strength from all the people around you who love you already. We feel so blessed. Welcome to the world, little Noam Zaydel. 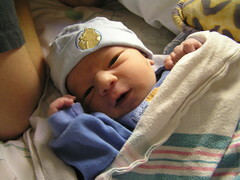 Baby Boy Radwin was born October 9, 2005 at 1:18pm. 7 lbs, 4 oz. 20 inches. Ariella and Baby are doing great.